• Lot of 20 Coins. Here is your chance to own a lot of twenty (20) 24KT Gold Plated U.S. nickels. 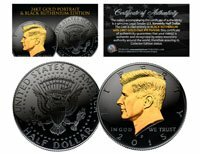 Each genuine legal tender U.S. coin is 24KT Gold Plated by the Merrick Mint to highlight the original design using a unique authentic process. The result is an everlasting 24KT Gold Plated coin collectible of ultra-high quality that is #1 in the industry. President Jefferson bust design on the obverse and Monticello design on the reverse. The nickel is a U.S. five-cent coin with coin year and mint marks chosen at random.